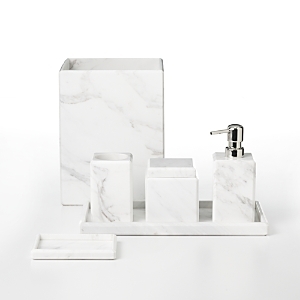 Luxury marble bath accessories add the final touch to your dream retreat. 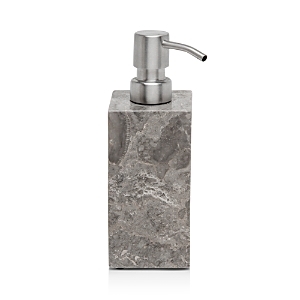 Luxury bath accessories made from marble create unsurpassed elegance. Distinctive hand-carved Italian marble for unsurpassed beauty. Marble body atop antique silver feet. 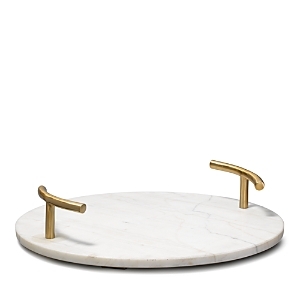 Hand-cast T handles Marble bath accessories with brass inlay. Handcrafted rectangular tray. Century marble and wrought iron with golden finish on metal handle and base. Two-tone marble frame. Black and white marble. Vanity accessories sold individually. Made of black marble. The Veneto collection by Pigeon & Poodle—defined by polished marble in a mélange of swirling gray tones—is the embodiment of modern sophistication. The Veneto collection by Pigeon & Poodle—defined by polished marble in a mélange of swirling gray tones—is the embodiment of modern sophistication. The Veneto collection by Pigeon & Poodle—defined by polished marble in a mélange of swirling gray tones—is the embodiment of modern sophistication. 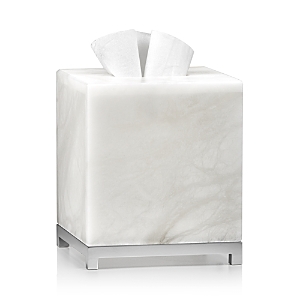 Tissue box cover in marble finish. Made of polyresin. 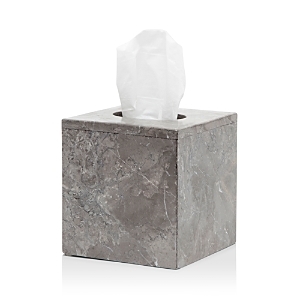 Wastebasket in marble finish. Made of polyresin. 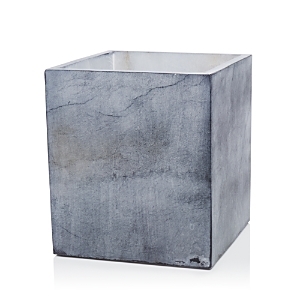 Lidded box in marble finish. Made of polyresin. Dual frame crafted of carrara and brass plated. 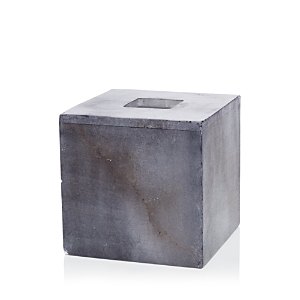 A gray marble table lamp with stacked crystal base. Topped with a rectangular hardback shade in white linen. Carrara marble and brass plated. Decorative use only. Marbled Carrera stone resin with a walnut-colored accent trim brings classic Italian sophistication to your private bath retreat or powder room. Marbled Carrera stone resin with a walnut-colored accent trim brings classic Italian sophistication to your private bath retreat or powder room. Marbled Carrera stone resin with a walnut-colored accent trim brings classic Italian sophistication to your private bath retreat or powder room. A beautifully understated collection in luminous alabaster. The stone is used in its natural coloring. Handmade of alabaster. Handmade of alabaster. Luminous Italian alabaster hand-fitted on plated brass lends a luxurious look to these sleek, elegant bath accessories by Labrazel. 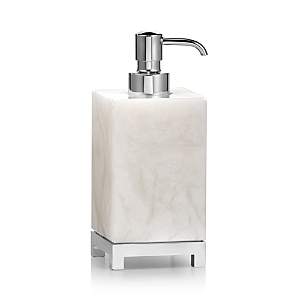 Luminous Italian alabaster hand-fitted on plated brass lends a luxurious look to these sleek, elegant bath accessories by Labrazel. Luminous Italian alabaster hand-fitted on plated brass lends a luxurious look to these sleek, elegant bath accessories by Labrazel. 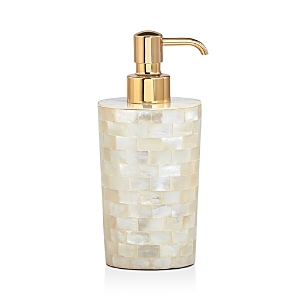 A beautifully understated bath accessory collection in luminous alabaster. The stone is softly tinted to produce the creamy ivory coloring. A beautifully understated bath accessory collection in luminous alabaster. The stone is softly tinted to produce the creamy ivory coloring. A beautifully understated bath accessory collection in luminous alabaster. The stone is softly tinted to produce the creamy ivory coloring. Crafted from luxuriant alabaster, the naturally marbled veining of each distinct Kassatex Alabaster collection piece brings artful elegance to the bathroom. Crafted from luxuriant alabaster, the naturally marbled veining of each distinct Kassatex Alabaster collection piece brings artful elegance to the bathroom. Crafted from luxuriant alabaster, the naturally marbled veining of each distinct Kassatex Alabaster collection piece brings artful elegance to the bathroom. Table lamp of alabaster and steel. Variance on the alabaster. 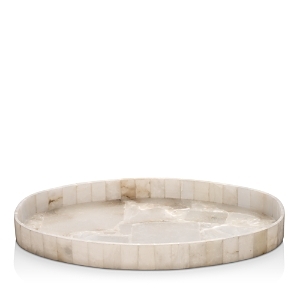 Tray crafted of natural alabaster with metal handles. Each tray will be unique as the alabaster is pieced together. Handcrafted tapered alabaster sconce. This item is made of natural stone so variations will occur in color, but that is the beauty of it. 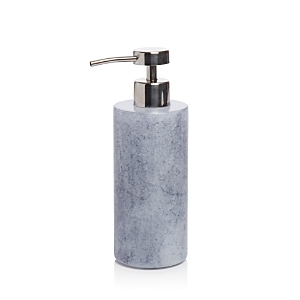 A stunning addition to any bathroom, this Roman Spa bath accessories collection from Roselli Trading Company is styled in beautiful travertine stone that gives your decor a luxurious look and feel. A stunning addition to any bathroom, this Roman Spa bath accessories collection from Roselli Trading Company is styled in beautiful travertine stone that gives your decor a luxurious look and feel. 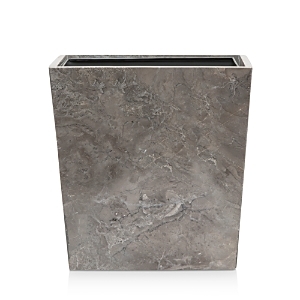 A stunning addition to any bathroom, this Roman Spa bath accessories collection from Roselli Trading Company is styled in beautiful travertine stone that gives your decor a luxurious look and feel. Arabesque-shaped table lamp. 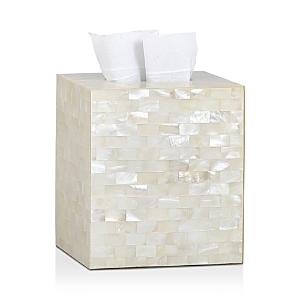 20"W x 17"D x 30"T. Cast resin base with hand-applied mother-of-pearl and silver-leaf finish. Linen shade. Highly polished and topped with opalescent tiled trim, the Paradigm Opal Shiny bath accessories collection brings stylish sophistication to your space. A mirror of great beauty and stature—and it's over seven feet tall! Mosaic frame is mother-of-pearl Handcrafted bath accessories made of wood and mother-of-pearl shells. The iridescent shimmer of mother-of-pearl is further accentuated by a high-gloss lacquer finish. 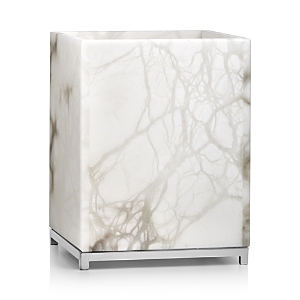 Carefully selected natural materials allow for infinite variations resulting in one-of-a-kind designs Sleek meets shimmer in this lamp with a body of mother- of-pearl that sits on a block of crystal complemented by the lines of the rectangular white linen shade. 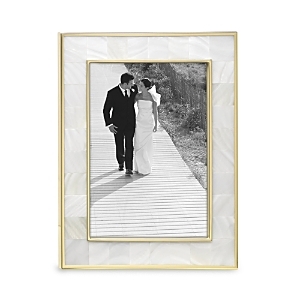 Display your favorite memories in elegant style with this striking frame, featuring a Mother of Pearl inlay. Decorating on the natural side—this lean floor lamp is tall on style and texture Scintillating natural mother of pearl lends luminous shine to this handcrafted Jamie Young mirror. Honeycombs of lustrous mother-of-pearl connect to create this small trinket box. Wood composite and plywood base. Lacquered finish. Mother-of-pearl tray is adorned with a honeycomb pattern of frosted pale blue hued mother-of-pearl protected by a lacquered finish. Wood composite and plywood base. 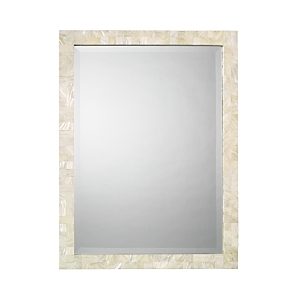 Rectangular mirror. 24"W x 1"D x 36"T. Hand-laid mother-of-pearl inlay. Finish and pattern may vary. Hangs vertically or horizontally. Rich pearl hammershell creates a stunning collection of bath accessories. Each piece reveals hints of pink and gold, for a sparkling touch to your bathroom decor. Rich pearl hammershell creates a stunning collection of bath accessories. Each piece reveals hints of pink and gold, for a sparkling touch to your bathroom decor. 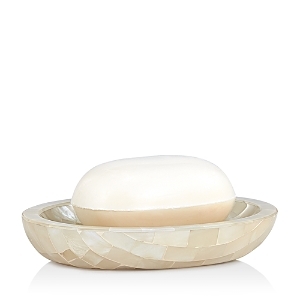 Rich pearl hammershell creates a stunning collection of bath accessories. Each piece reveals hints of pink and gold, for a sparkling touch to your bathroom decor.